Wouldn’t it be cute if every time you sneezed, your dog ran over and brought you a tissue? This fun trick is really just a variation on fetch. Grab your clicker and treats, plus a tissue box. Get one of the square ones where you pull the tissue out through the top and the next one is always sticking up. Warning: You will probably go through a lot of tissues! 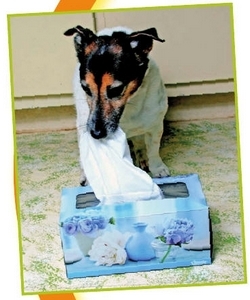 Start by placing the tissue box on the ﬂoor near your dog. When she sniffs at it or touches it with her nose, click and treat. Repeat several times until she is consistently touching the tissue box. to wait with your click until she touches the tissue that’s sticking up—not just any part of the box. Repeat several times. When your dog is doing that regularly, don’t click until she grabs at the tissue. If she pulls it all the way out, make a big deal of it. As she gets quicker about grabbing the tissue, reinforce her only when she pulls it all the way out of the box. Repeat several times. Put each tissue that she pulls out either in the trash or to the side where your dog can’t see it. This way she won’t get confused about which tissue she is supposed to grab. Many dogs ﬁnd pulling the tissue out of the box really fun, much like when they pull the stufﬁng out of dog toys. Dogs especially enjoy doing tricks that they ﬁnd fun. They are more exciting than the ones where the only appeal is that they get reinforced with a treat. Encourage your dog to bring the tissue to you. As she gets better at pulling the tissue out, start clicking only if she brings it to you, not if she drops it right next to the box. If your dog starts ﬂinging tissues through the air, stop her! This is pretty funny, but it’s not a behavior you want to encourage. Just say “no” in a ﬁrm voice and stop the game. Pick up the tissues and you’re done for now. Your dog will ﬁgure out that if she throws the tissues all over the place, the game stops. Try again another time. It won’t take long for your dog to realize that she needs to bring the tissue to you especially if you have tasty treats to trade. When your dog is bringing the tissue to you most of the time, add your cue. Your best choice is something like “achoo” or a fake sneeze. Slowly work up to giving the cue a little farther away from the tissue box. At this point, reinforce your dog only when she has been signaled to get the tissue. Tissues you didn’t ask for don’t count, and you don’t need twenty tissues for one sneeze! In the end, whenever you give your fake sneeze, she should run to grab a tissue for you. She may even do it after real sneezes!